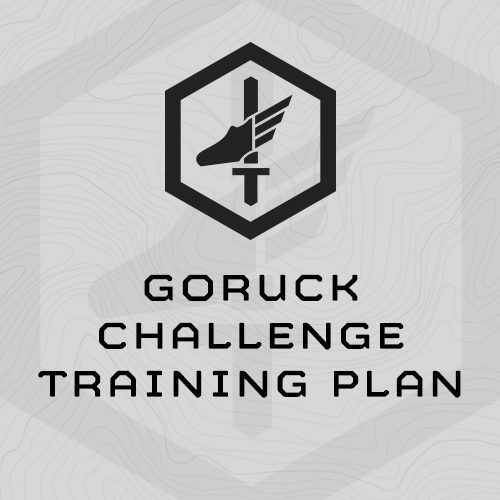 5-Week, progressive, sport-specific training plan designed to prepare participants for the GORUCK Challenge. The main fitness demand of the GORUCK Challenge is rucking, 20-25 miles with load. Additional fitness demands include lifting an carrying heavy, odd objects, extended calisthenics, and overall fitness/endurance for a 12-14 hour event. Ideally, you will train Saturday, take Sunday off, train Monday through Thursday, and take Friday off. – Build Rucking Performance/Endurance – The best way to improving rucking performance is to ruck. During this program you’ll ruck 3 days/week, and at the top of the cycle, will ruck 16 miles in one session, and 30 miles in a week. 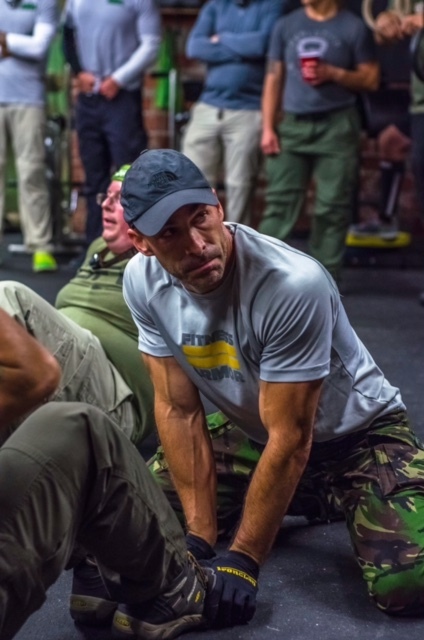 – Build Work Capacity – GORUCK Challenges are more than long rucks. You’ll be tasked with multiple team events which will test your overall work capacity. This program includes multi-modal and odd-object work capacity events to prepare you. – Build Overall Strength – You’ll move some iron in the weightroom as part of this program. The focus is on your leg/hip/core and upper body strength. Strong athletes perform better and are more durable. – Build Core Strength – Rucking under load and the team events will especially stress your midsection. This program hammers core strength 5 days a week. You’ll come to love/hate sandbag getups and other core exercises. – Build Mental Fitness – Saturday training sessions are long, hard grinders which combine distance rucking with multi-modal, work capacity events. Your Saturday training will most closely resemble what you’ll face at the GORUCK Challenge and build/test both your physical and mental fitness. - Fully equipped weightroom. The gym-based parts of this program require access to and the equipment in any commercial gym. - Sandbag. Men will need a 60-pound sandbag, Women will need a 40-pound sandbag. - Ruck or Back Pack. Ideally you’ll use the same Ruck to train with that you’ll use during the GORUCK Challenge. You will also need to load it with the same weight you’ll carry during the challenge. - Pedometer/GPS - You’re going to be rucking a lot during this program, and will need to know distance and pace. Unless you drive or bike the route ahead of time, a Pedometer or simple GPS unit will help you greatly and allow you to vary your rucking courses during the training program. Several weeks ago I purchased your GoRuck training program and put it to use. Your training program was well worth the money and was essentially an investment in me and my fitness. The five week plan had prepared me for the challange so well I had the energy and strenght to encourage/assit others who were not as ready to meet the physical demands. At the end of the 8 1/2 day I still had plenty of strenght, stamina and endurance left making the challange extremely enjoyable, so much so I have already signed up for another one. Thank you for taking the time to create this plan. Another quick note to let you know that the 5 Week GoRuck Program worked perfectly. My buddy and I followed the program from 5 weeks out and had no troubles with strength, conditioning or endurance at any point during our event. In fact we were a few of the strongest at the end and finished knowing that we had fitness to spare. That's not bad for a couple of older desk jockeys. Thanks again for taking the time to answer my questions and producing a program geared towards such a fun event. "I wanted to thank you for your 5 week Goruck Training plan. I just did the Goruck Challenge 10/27/12. Class 300, and I can tell you that your plan not only helped me physically but mentally also. When I first recieved the plan and started looking through the workouts and how they progressed I thought to myself " no freakin way ! ", but when I actually did them I realized how much I was capable of and it changed my outlook on the challenge itself. After your workouts I was more motivated and excited to do the challenge because I knew I could do it. Your plan helped me focus on the task at hand and not dread the whole ordeal. I'm 43 and have had knee and back injuries that caused some concern but I believe your plan also kept me injury free because of all the core and leg work. You were right I actually started to love the sandbag getups, what an awesome exercise ! I am going to continue following with Military athlete's programs because they work ! Thanks again." -M.
I completed my GORUCK Challenge this past weekend. I’d like to send a big thanks to you and your team because your training program was the primary reason I was physically prepared for the event. I was able to perform at a high level for the entirety of the event. While I think it would be a bit arrogant and probably wrong to say I was one of the strongest; I certainly was not one of the weakest. I was able to enjoy the event. Below I’ve added feedback specific to the five stated goals of the program. If you’re interested please keep reading, if not, no worries. Build Rucking Performance/Endurance – I wholeheartedly agree with the first statement: The best way to improving rucking performance is to ruck. I was very intimidated by Session 1 (8mi @ 15min/mi) and I suffered through it. However, within a couple of weeks an 8mi ruck at 15min/mi was an enjoyable way to spend two hours. The amount of time spent under a weighted ruck really, really helped during the event. By the time the event happened carrying a 50# ruck was like carrying an empty ruck. I was so comfortable and used to the weight it didn’t slow me down at all. In retrospect I felt over prepared in the rucking domain (which is not a bad thing at all!). Build Work Capacity – This really helped during the multiple smoke sessions; especially for the 3 hour smoke session at the end. There was never a point in the event where I was close to out of breath. Build Overall Strength – I definitely had the leg strength. Legs were never a limiting factor. In this particular event we spent many hours carrying multiple logs as a team. I spent nearly the entire time under a log, which really exposed one weakness in me. My shoulders got smoked. They are still a little sore. More on this later. Build Core Strength – You were right I simultaneously love & hate sandbag getups. It’s a miserable ten minutes but dammit it’s an effective ten minutes. Through almost the entire event my core felt strong. It was only at the end when one of the cadre decided to destroy everyone’s core did my core finally fail. Awesome work on the core stuff. Build Mental Fitness – I did this whole program by myself so during the event to suffer in a group of people felt like paradise. That said, it did help to have those long Saturday events. It was helpful to see how my body reacted to that type of effort for so many hours. These are things I didn’t address or address well enough during training. Keep in mind this is just one man’s opinion after one specific instance of an event. More time rucking with extra weight on my shoulders at a slower pace. Only in very short bursts did we move at 15min/mi or better. The majority of the time we were much slower than that because we were loaded down with logs or buddy carries. It would have been helpful to do multiple 2mi rucks at 17-20min/mi with the ruck and the sandbag. More vertical shoulder pressing movements. I think this would have helped the log and odd item carries we had to do and the log press PT we had to do multiple times. Basically my shoulders needed more work. Thanks again for the programs and for answering all my emails. I really appreciate it. I completed a GORUCK Tough event after completing your GORUCK Challenge plan and the plan certainly did it's job. Firstly, the rucking was never an issue and my core never felt fatigued. The sandbag get-ups and low back complex forged a tough chassis that never failed me. Secondly, the Monday and Wednesday strength and work capacity session did there job, no single "smoker" during the event put me out for more than a minute or two and even on hour ten my recovery was quick. Finally, the Saturday mini events were also spot on, after the final and longest of them all I knew exactly what to expect for the event. During the whole GORUCK I felt like I had energy on reserve, enough so that I felt that my individual performance exceeded my expectations but I was also able to continuously contribute to the team and motivate individuals when things got tough. Thank you for the plan, it is perfect.